I realise it’s been a few weeks since I posted an entry on this blog. The reason is quite simple. A couple of weeks ago I visited the Lake District for a few days in the company of Paul Gallagher, a renowned UK based landscape photographer who just loves black and white. He is also a Master Printer for Epson; so what he doesn’t know about printing just isn’t worth knowing! It’s also been a very busy time for me personally and I wanted to reflect on what I had learnt before posting my thoughts and any of the images. The photograph below was taken on the day I arrived in The Lake District before I met up with Paul the next morning. It was late in the afternoon so I had a limited amount of daylight left to take any shots. 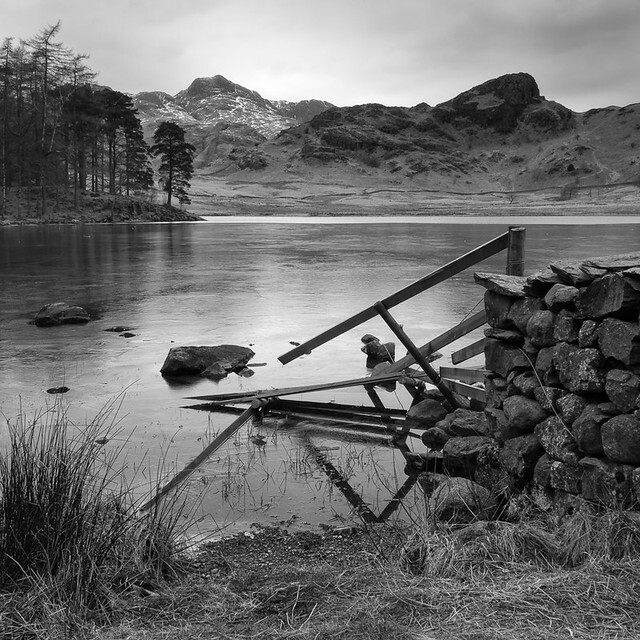 Blea Tarn was frozen over and I processed the image using a combination of Lightroom and Silver Efex Pro2. As it happens I would not using this plug-in again for post processing…..Paul was about to demonstrate to me the power of Photoshop……so more about this in a future post! The setup for the 121 or personal workshop was to spend two days out and about taking images, learning about camera technique, camera settings, composition, histogram and the use of filters etc. The third day would be spent back at his studio processing the images and producing large A3+ size prints. In essence I was keen to bridge the gaps between camera work in the field, processing and printing. In other words to develop a work flow whereby my photographic thinking or pre-visualisation at the time of taking the shot would be influenced by how I wanted the final image to look once processed and printed back in the ‘digital’ darkroom. The aim would be to combine the three elements into one, as opposed to treating them as distinctly separate processes where coherent thinking doesn’t overlap. This will therefore be the first of a series of probably quite short posts about the various topics which we covered over the three days, including of course, some of the images taken. I should add that I had an extra day free in the middle of the 121, which gave me time to put into practice some of the techniques and ideas we had talked about in the first two days. In my opinion this was invaluable, as I could take some shots unsupervised by Paul before returning to his studio. He also set me a few challenges…..would I succeed or would I fail?